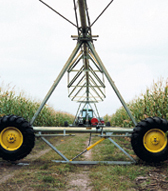 Towable center pivot or linear move irrigation systems must be able to move quickly and easily from location to location when irrigation timing is critical. Rotating the wheels for towing can be a difficult task in a muddy field on a hot day. T-L’s exclusive scissor jack design utilizes the availability of hydraulics to lift the towers enabling tire rotation in minutes. While others are struggling, you will be on your way to the new location irrigating more acres more efficiently. 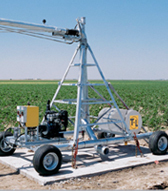 T-L’s Towable Pivot Irrigation System’s mobile design mounts the power source, hydraulic pump, and fuel tank on the pivot point enabling towing preparation to maximum efficiency. 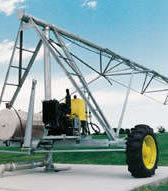 T-L Towable Pivot Irrigation Systems enjoy the same features as our conventional, hydro statically driven center pivot irrigation systems; continuous movement, reliability, low maintenance, simplicity, and safety. All things considered, the choice is simple, T-L.
For longer towable center pivot designs the T-L 4 wheel quick tow option offers unmatched stability, with the fastest towing and the least amount of labor in the industry. Why He Likes His T-L’s: Safety, Dependability, And Ease Of Maintenance.